Ever since I’ve heard about the growing food truck scene in San Diego, I’ve been itching to visit one of the newer local food trucks. The only food truck I’ve ever been to was La Princesita Taco Truck that parks over in Linda Vista and had deliciously cheap tacos. Last week I finally got to visit one of the trucks and with a coupon in hand (thank you LivingSocial) to try out some grub. Devilicious Food Truck starting going to the Miramar area for lunch on Wednesdays giving me the perfect excuse to cut out a little early for lunch time grubbing. Last week I left the office right at 11AM. I parked right next to the truck and stood in the growing line extending out onto the sidewalk. I tried to get a peek at the chalkboard menu before I could see it even though I already had a pretty good idea of what I wanted to order. With my coupon in hand and a couple of extra bucks, I placed my order. I was happy to see they take cards for an extra .50 fee! I waited up on the grass, waiting with all of the other folks who had placed their orders. It was a beautiful sunny day and I stood with my hands in my pockets, listening to the tunes coming out of the truck’s stereo while waiting for my food to be ready. I think it’s fun that you can see them working away in the truck through the semi-transparent screen. I tried to guess when my food would be out next. After getting my food, I sat in the grass near the truck, incurring the wrath of ants and grass clippings as I enjoyed my lunch. 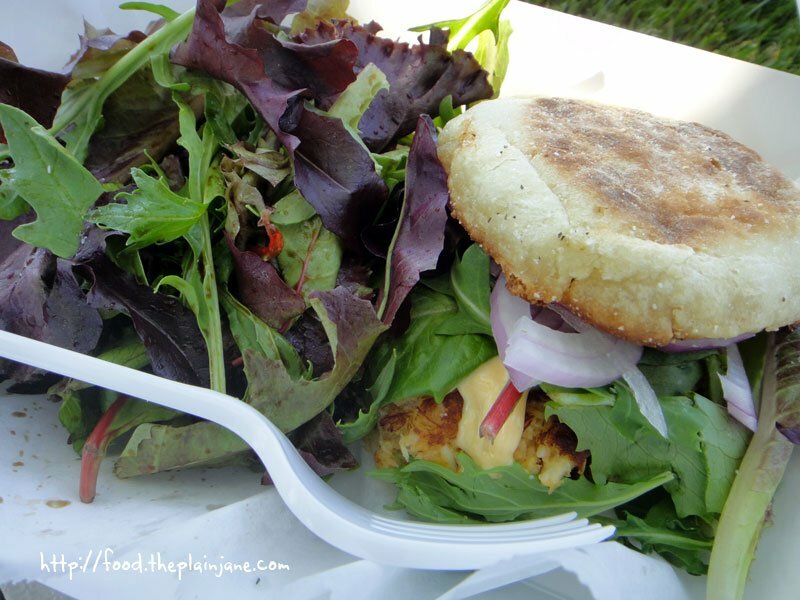 Here’s what I ordered: above is the Crab Cake Sandwich ($7) (also available with a fried egg on top, which I declined) that comes with Devilicious sauce, greens and onions on a toasted English muffin. * Update: I emailed the Devilicious crew and found out that the Devilicious sauce is simply Mayo and Sriracha! The inside of my crab cake sandwich, bitten into and all. This truly is an “all-crab” cake. It’s pulled together with just enough binder to keep it steady and it really flavorful. I loved the toastiness of the English muffin, too (I suspect it was toasted on the grill, though I didn’t actually check), it had a wonderful crunch. The sauce and greens were also a nice accompaniment to the whole sandwich – I really enjoyed it! It was nice and refreshing to eat something like this for lunch! I also loved that every sandwich comes with a little salad of simply dressed greens. Since my coupon deal was for $12, I also got some Truffled Parmesan Fries ($4). This was a pretty hefty order of fries, one that I did not finish by myself. I had fun watching them toss my fries in a metal bowl and add sprinkles of truffle and Parmesan before giving me my order. My only complaint here is that the pieces of Parmesan are kind of unwieldy. They’re wider then my fries and just kind of hard to eat – I wished it had been grated instead, something that maybe would have stuck on a little bit better. But other than that these fries had a wonderful aroma and flavor. They were hot, crisp and perfectly seasoned – if someone were to tag along with me for food truck lunch-ness, I would get them again! On my second visit to the food truck (which was this past Wednesday… I see a trend in the making), I opted to try out the Butter Poached Lobster Grilled Cheese ($9). I also upgraded my green salad to caprese for an extra $2 – this got me the addition of some fresh tomatoes and marinated mozzarella balls on top of my greens. 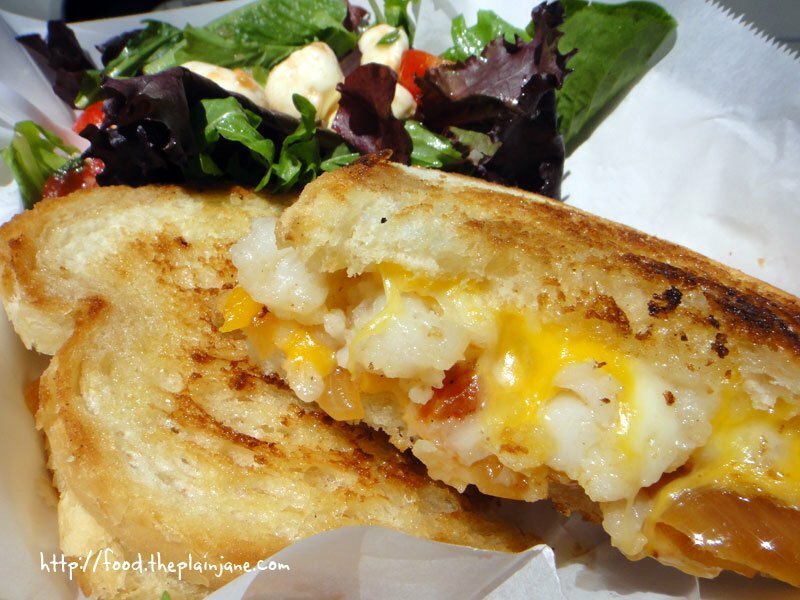 $9 for a grilled cheese sandwich is pretty stiff… but it’s got gobs of lobster in it to satisfy your craving! The lobster is moist and juicy and lends a lovely flavor to the mixture of cheese, tomatoes, grilled onions and crunchy grilled sourdough bread. It’s really a delightful combination of flavors and I happily sat in the grass, fending off ants for a 2nd time, as I munched away on this delicious sandwich. While I did enjoy the lobster, I would also be perfectly happy without it since I loved the crispy, golden brown sourdough bread so much. I just love bread and bread loves me. It’s serious between us. The caprese addition for my salad was a nice mix up to plain, old greens but I’m not totally convinced it was worth the extra $2 bucks. I was in the mood for some mozzarella that day so it was good then, but not something I would probably regularly get. 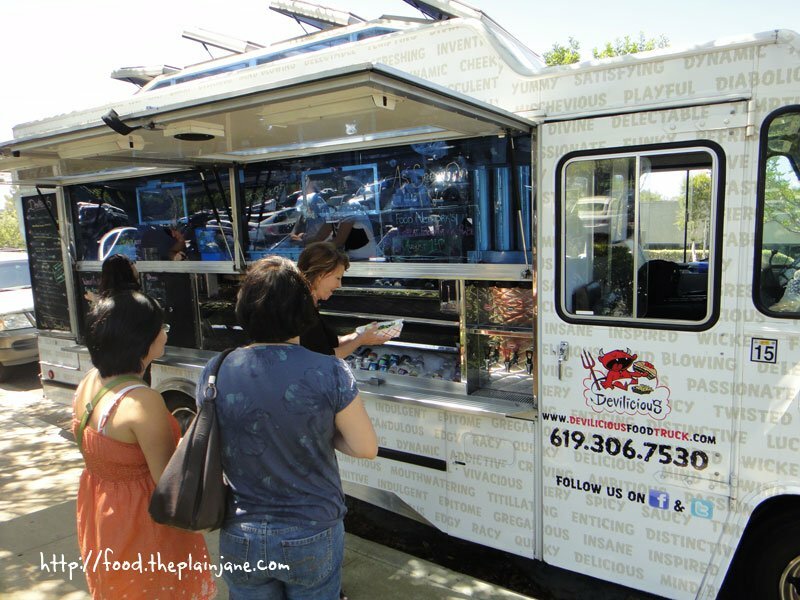 Devilicious Food Truck is also gearing up for their premiere on Food Network’s The Great Food Truck Race, Season 2. Catch them on the Food Network this Sunday at 10PM! so which would you take if you had to choose between the crab cake and the lobster grilled cheese? and I saw the crab cake has “devilicious sauce” can you describe it? I found out that the Devilicious sauce is Mayo and Sriracha! Hi Mary, still haven’t had a chance to check these guys out. I think my heart is grateful for it, haha. But one day I’m sure along with Super Q. Excellent crabcakes! (And I’m from Maryland, I take that stuff seriously!). Hi Rodzilla – If I had to choose, I’d get the crab cake sandwich. 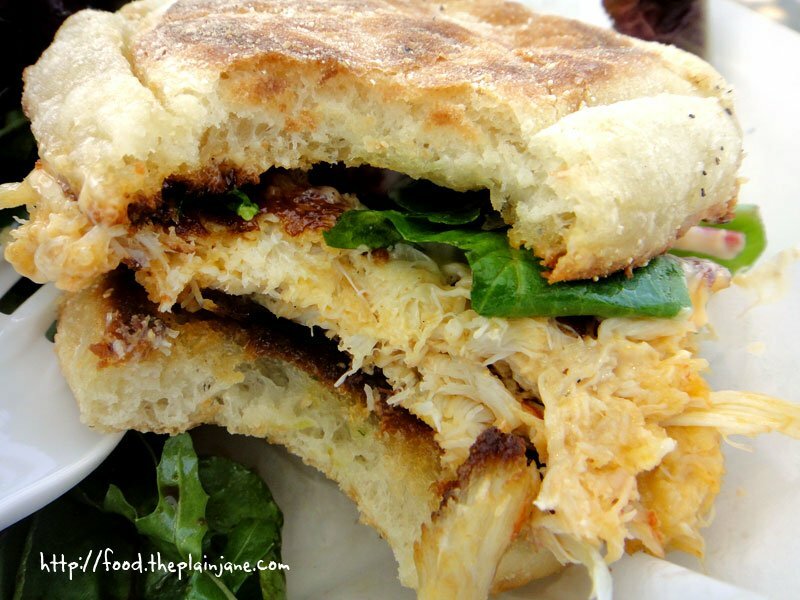 It’s really flavorful – all crab meat – and I love the use of the crisp English muffin. The sauce is described as a “spicy” sauce, but I don’t remember it being too spicy for my tastes. It complimented the sandwich and didn’t hinder it but I didn’t take the time to really taste it on it’s own. I emailed Devilicious to try and get the scoop on what’s in the sauce though! Hi Dennis – The upside to all of their sandwiches is that you do get a nice mixed green salad instead of fries – that sure counts for something! 🙂 I still have to make my rounds to the other gourmet foodie trucks! Hi Gwen – Yes, I did love their crab cakes! I think you recommended them to me on Twitter – good choice! Hey Mary, sweet review! My friend told me about this truck and I’ve been meaning to check it out. She also loved the crab cake sandwich. Mmmm…can’t wait to check it out! The crab cake sandwich is really good. Hope you get to check them out soon! 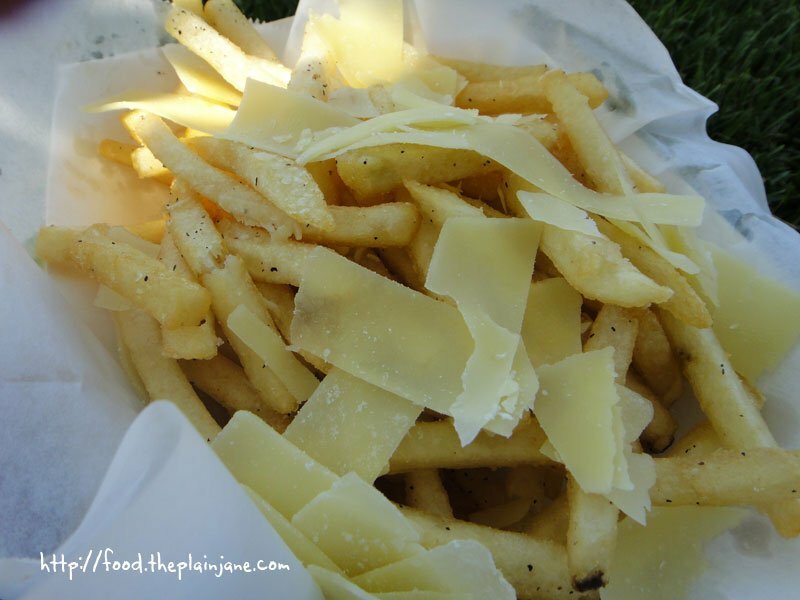 Oh I really want those fries in your picture – nice review! It all looks so good… makes me wish I were in SD right now! We’d love to see some of your reviews on our blog!